Quo Vadis is now known as the student organization that gives tours of Pitt’s 30 Nationality Rooms in the Cathedral of Learning — but it wasn’t always this way. According to Yasemin Sonel, a sophomore and the public relations officer for Quo Vadis, the club’s duties used to be a little different. In 1944, Helen Pool Rush, the dean of women at the time, founded Quo Vadis as an all women’s group that served tea to visitors before showing them around the Nationality Rooms. The club’s traditions have evolved, and for good reason, Sonel said. 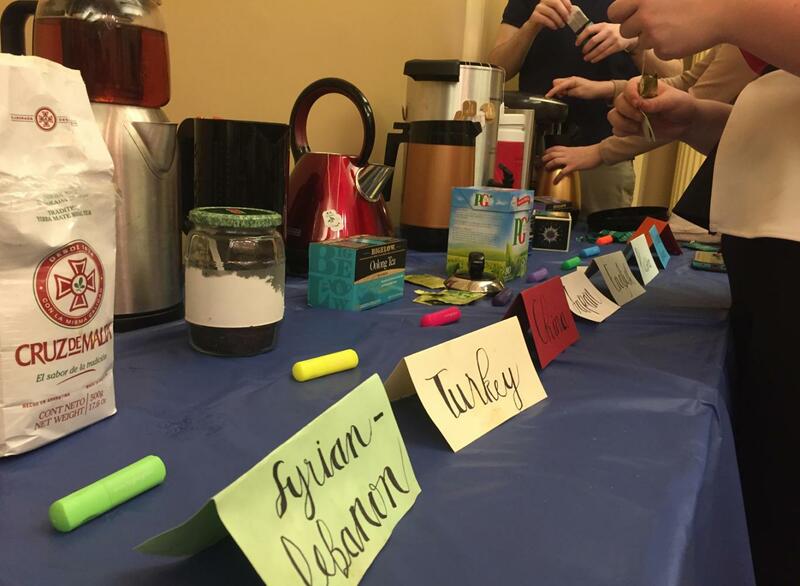 While the club no longer serves tea before its tours, visitors were able to participate in the old tradition Feb. 2 and 3 at Quo Vadis’ Around the World in 8 Teas: A Nationality Rooms Event. The tours ran about an hour and a half and started every 15 minutes between 6 and 8:30 p.m. both days. The organization held the event as a fundraiser for the club, a departure from the organization’s usual fall semester fundraisers. The club usually holds two events per year — Halloween tours when guides take guests to Nationality Rooms and share scary stories, and an open house that has all rooms open and the guides dressed in traditional garb. While the open house is free to attend, the tea tour was not. Tickets were $8, a figure that included tea and cookies at the conclusion of the tour. According to Sonel, the executive board had the idea before winter break and spent the past month planning it, gathering supplies and getting the tour guides up to speed on tea facts for the various nationalities. Visitors started at the Syrian-Lebanese room, then moved to the Russian room, the English room, the Chinese room, the African Heritage room, the Indian room, the Japanese room and the Turkish room. Upon entering each room — with the exception of the restricted-access Syrian-Lebanese room — guides greeted the visitors. Visitors then received a brief overview of the architecture and various symbols in the rooms as well as the importance of tea to the nationalities’ cultures. Annie Hayden, a sophomore tour guide in Quo Vadis and a guide for the tea tour, said she knew the facts about the rooms already from her time as a tour guide. It only took her a few hours to memorize additional facts about the Turkish room, where she spent her time presenting. She didn’t mind putting in the extra time because of the visitors’ reactions. Visitors heard about the importance of tea in a variety of cultures, such as how green tea is the tea of choice in China, and that tea is a symbol of camaraderie and conversation in Turkey. The tour ended in the Croghan-Schenley Ballroom where visitors were served eight different types of tea along with light snacks. The flavors of the tea correlated to the different nationalities: matte for Syria-Lebanon, black tea for Turkey, oolong for China, matcha for Japan, black tea for England, a different type of black tea for Russia, darjeeling for India and mint tea for Africa. John McRandal of O’Hara Township said he felt the combination of the information about tea and the Nationality Rooms worked nicely. Others, such as Carolyn Rosso, also of O’Hara Township, were enthused about the Nationality Rooms, even if the tour was shorter than initially expected. Sam Swerdlow, of Regent Square, was also a first-time visitor to the Nationality Rooms. He took advantage of the event to learn why the Cathedral was so popular. “Just getting to find out what the big deal is and getting to see the rooms for the first time was great,” Swerdlow said.